Day One by Bloom Built, LLC – “Day One is a journaling platform to record and preserve your memories for the long term.” It is available for Mac and iOS and provides syncing across devices using iCloud or Dropbox. 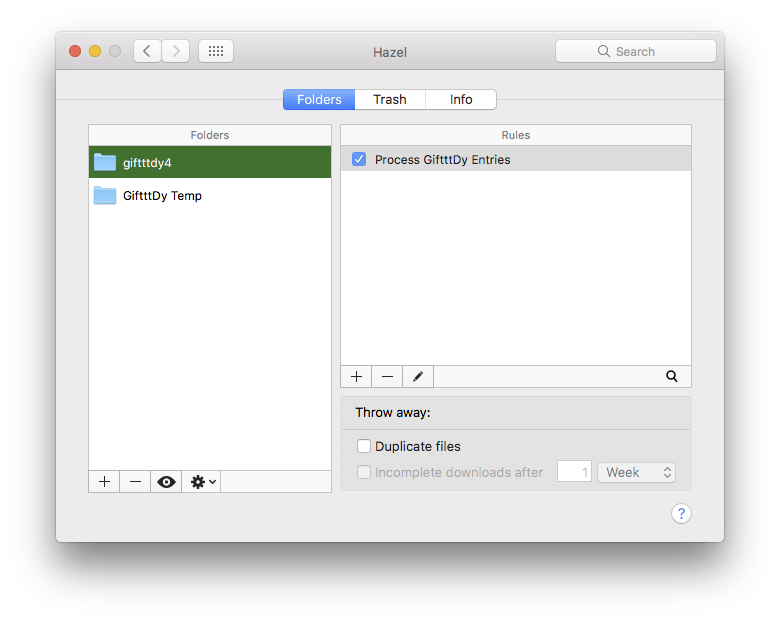 NoodleSoft’s Hazel – A great tool for automating your Mac. Dropbox – The best online storage service around. Get 2G for free! And, most importantly (and I’m not just saying that because I wrote it), the GiftttDy script, which you can download from here. Remove the old Hazel rule for GiftttDy Temp (but leave that folder in Hazel). Make sure your lifestream journal is your default journal. GiftttDy only sends to the default. Install Day One 2 (remember to set up syncing if you want to use the journal on you iOS device), Hazel, and Dropbox. Also located in the GiftttDy.dmg file is the GiftttDy Configurator. Double-click to launch it. It will set up the necessary directories and ask you to set preferences for how GiftttDy creates entries in Day One 2. When the Configurator is done, it will display a window with configuration information that you will need for step 3. It will then refer you back to this page to complete the Hazel set up. You should see the GiftttDy Configurator message window, the Hazel preference pane, the GiftttDy.dmg file Finder window, and your web browser displaying this page. You may need to move windows around to see everything. Problems? I’ve had a report of the GiftttDy Configurator hanging after prompting you to locate your Dropbox folder. If this happens, please try the alternate installation method. If you’re not familiar with Hazel, DON’T PANIC. It’s actually pretty simple. The GiftttDy Configurator should have opened the Hazel preference pane for you. If not, open System Preferences, then click the Hazel icon. If it’s not already selected, click the Folders button near the top of the screen. On the left side of the screen, you indicate the folders you want Hazel to watch. Click the + at the bottom of the Folders section. In the GiftttDy.dmg file, double click the giftttdy4.hazelrules file. 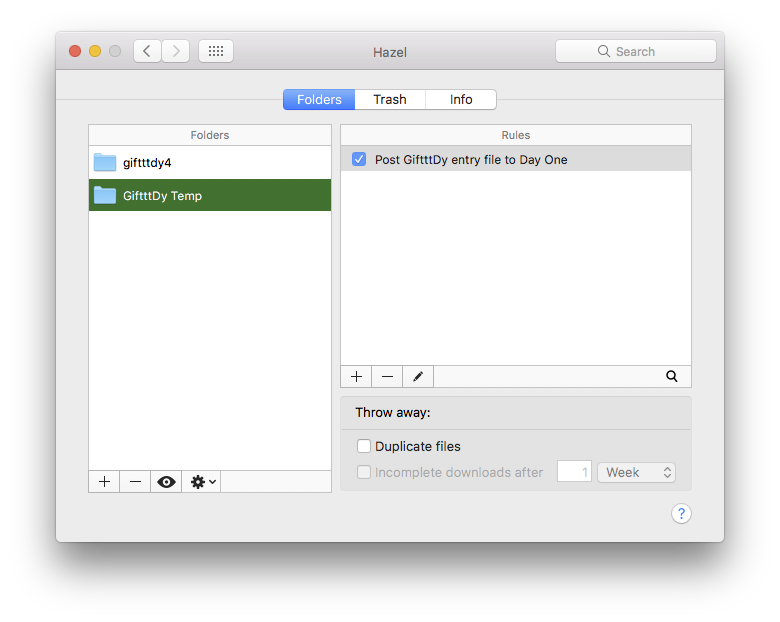 Hazel will ask you to “Chose a folder to import rules to:” Choose the folder named “giftttdy4” and click import. Check the check box next to the Process GiftttDy Files to Day One rule on the right side of the screen. Check the check box next to the GiftttDy Temp rule on the right side of the screen. You can now close the Hazel preference pane. Now, your Mac is all ready to go. Next, you need to get yourself an IFTTT account so you can set up the rules that will grab your social media posts and put them in your Dropbox folder. For a list of the recipes I’ve created for use with GiftttDy, please see my recipe page. Problems? Questions? Need a place to troll? Want to share your deepest, innermost desires … ahem … for GiftttDy? Check the Frequently Asked Questions page or contact me.